Getting married at the Berkeley Botanical garden offers you the opportunity to have your wedding ceremony among the large Redwood trees in the cozy amphitheater. 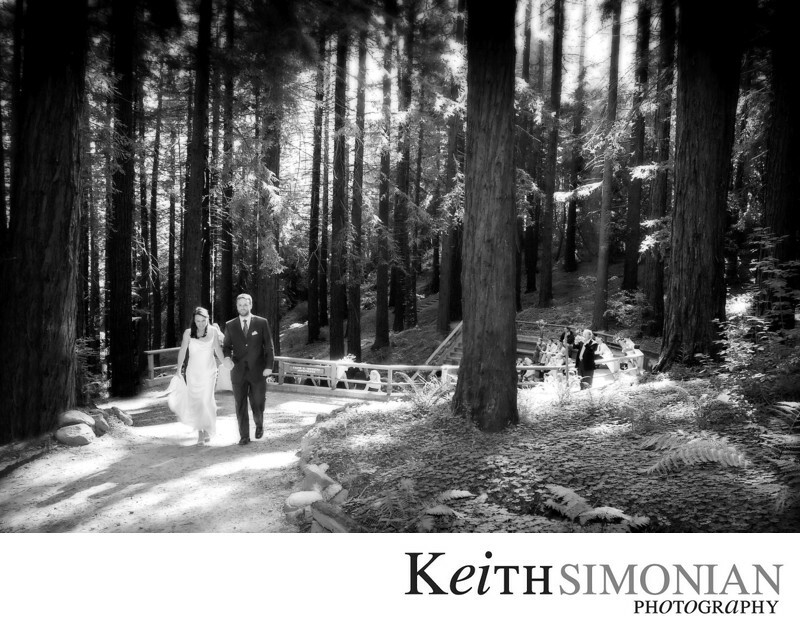 Here the bride and groom have just been married and are walking out of the redwood lined amphitheater to their wedding reception. Their wedding reception took place just across the street in the main area of the Botanical Gardens that encompasses 34 acres and includes a Rose Garden, plants from around California, aquatic and carnivorous plants, and a Chinese herb garden. A wedding reception in the Conference center offers wonderful views of the surrounding Berkeley hills. These compliment the amazing views of the San Francisco Bay that one gets driving to or from the Berkeley Botanical gardens as they are quite high up in the Berkeley hills. Location: University of California Botanical Garden at Berkeley 200 Centennial Dr Berkeley, CA 94720. 1/25; f/6.3; ISO 800; 17.0 mm.